You don’t get married at Walt Disney World unless you are a sucker for Disney magic and want to add a little of that pixie dust to your big day. Well, I’m into Disney magic hook, line, and sinker. It didn’t surprise too many people when Andy and I wanted to get married at WDW. 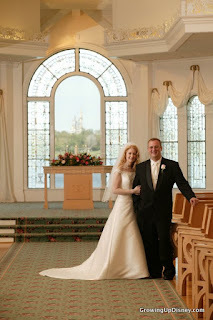 Our wedding was held at Disney’s Wedding Pavilion in April 2005. One of the things I still rave about was the team that a Disney Fairy Tale Wedding provides you. If you’ve watched any cable television in the last few years, you’ll see that wedding planning can be a pretty crazy business. I love that everyone involved in a Disney wedding has worked with each other and in these locations. 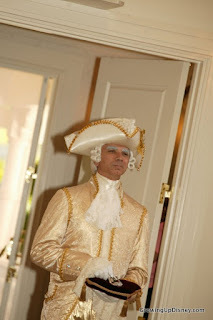 Our wedding planner took care of arranging everything for us and Disney has someone to handle just about anything. 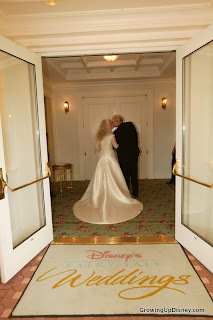 For our ceremony at Disney’s Wedding Pavilion and reception at the Grand Floridian, the locations, music, photography, videography, hair and makeup, floral, transportation, and food were all Disney services. The Cast Members involved in our wedding were wonderful and we didn’t have to hire these vendors ourselves. Just about the only thing we had to do on our own was provide our clothing. And Disney even helped out with that, suggesting a tuxedo rental service that would do fittings at our resort and deliver and pick-up the suits as well. That same company sent a lady out to steam my gown. My husband, Andy, loves this story. His boutonniere was crushed from all of the hugging after the ceremony. (Hey, my side of the family is Southern: we hug.) After the guests were sent off to the pre-reception, our wedding planner saw the flower, got on her walkie talkie, and before we knew it, a nice man from the floral department was there pinning an exact replacement on Andy’s lapel. Now all that organization and general lack of drama allows you to relax and enjoy the wedding and the guests who have come to celebrate with you. But the real reason for a Disney Fairy Tale Wedding is magic. First, the location. You can have your wedding and reception just about anywhere on Walt Disney World property if the price is right, but they use a few outdoor settings and the pavilion most often. Like the good Disney nerds we are, my family and I toured the pavilion shortly after it opened 15 years ago. 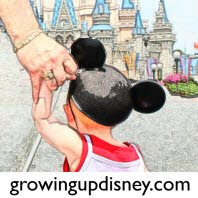 Once I met my prince, there was no other place for our I Do’s, after all, as a Disney Vacation Club member, Walt Disney World is my home away from home. The Imagineers who designed the Wedding Pavilion managed to conjure up every detail of a girl’s dream wedding. It’s a white Victorian style building, wrapped in windows, nestled on its own island in Bay Lake and surrounded by lush landscaping. Inside, there is a wide center aisle flanked by pale wood pews with hearts on the end. The carpeting is in soft shades of pink and green with just enough roses worked in. 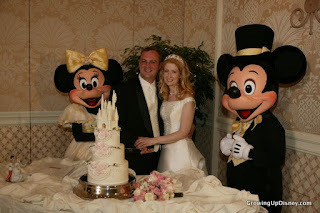 The curtains are hung from double wedding rings and the gingerbread work around the top of the room includes the silhouette of a certain mouse. The audio and video equipment is all built in; so there is no videographer running around, distracting from the ceremony. Once the double doors at the back of the chapel are opened and you make your way to your prince, you can take in one of the best parts of the pavilion. The window in the back overlooks Cinderella Castle. You simply cannot beat that. I remember seeing birds flying over the water and the monorail going in and out of the station at Magic Kingdom. I love that the castle is in our photographs. It’s subtle and so beautiful. We surprised everyone with this next bit of Disney wedding magic. During our wedding planning session at Franck’s, my mom decided to “rent herself a man.” Before you get the wrong idea, our wedding planner had suggested having either a majordomo (think the man carrying Cinderella’s glass slipper, Prince Charming’s right hand man) or an English butler. Of course, I wanted the majordomo. He would carry our rings to the altar and act as master of ceremonies, helping our guests get from the ceremony to the pre-reception and then to the reception. At the reception, he’d help us make a “Grand” entrance. Mom loved the idea of someone else being in charge of the day, allowing her to relax and enjoy it all. The wedding planner also suggested playing a little prank on our brothers. My brother, Chris, was my “Man of Honor” and was holding Andy’s ring for me. Andy’s brother, Gary, was one of his Best Men and had my ring. Before the ceremony, the wedding planner asked the guys for the ring, telling them the minister, my father, was going to bless them. They forgot all about the rings, playing right into the joke. During the ceremony, when it came time for the exchange of rings, my father asked the guys for them. Both got looks of panic across their faces and said something about blessings. Just then, there was fanfare and the back doors of the chapel opened. An instrumental version of “When You Wish Upon A Star” played and majordomo walked down the aisle carrying our rings in a glass slipper on a pillow. We had kept this a secret, so this was a huge surprise to the guests. I knew it was going to happen and I still cried! My mom still says my friend Heather’s face was worth the cost. The majordomo bowed to me and then presented the rings to my father. This was one of the best Disney touches of the day and I love watching it on the wedding video. The most magical part of our wedding was a visit from Mickey and Minnie. I danced with Mickey Mouse at my wedding reception. How cool is that?! This was a surprise gift from my father. He didn’t even tell my mom about it. Dad called the wedding planner and asked that Mickey and Minnie be invited and requested that she leave it off of any paperwork until after the event so that I wouldn’t be tipped off. It worked. We had all just finished dinner and were chatting with the guests. Our pianist started playing the Mickey Mouse March and in walked the Big Cheese and his Main Squeeze in their formal attire. I think my jaw hit the floor. For a lifetime Disney kid, this was the highlight of the day other than marrying my prince, of course. Mickey and Minnie danced with my husband and myself and then watched over us as we cut our gorgeous cake which resulted in another of my favorite photos. Speaking of photos, we didn’t have a huge number of wedding guests and every one of them was able to have at least one picture taken with their favorite mouse. We had such fun goofing around with them. Minnie had Andy get down on one knee for her and she acted jealous when Mickey hung out with me. Mickey covered his eyes while Andy gave me a kiss. There are so many more special memories and magical moments from our Disney Fairy Tale Wedding. I can’t imagine a better way to begin my life with my wonderful husband. We were able to celebrate with those closest to us in our favorite place.